The secret is out. And it’s something Canada’s Atlantic coast diners have known for years. The Maritime Provinces of New Brunswick, Nova Scotia, and Prince Edward Island, along with Newfoundland and Labrador have caught up with the rest of Canada’s burgeoning culinary fame. Resourceful chefs have mastered making every ingredient count, and it’s all about dedication to quality. Whether you’re exploring the region on a family vacation or you’re a local teaming up with a fellow foodie to discover your new favorite spot, check out some of these top Atlantic Canada restaurants. Not in the area? OpenTable has you covered with more than 50,000 restaurants around the world, including eateries in your city. Modern kitchen and old-world cooking techniques, a generous and relaxed atmosphere, food that’s pure and sensual – this is how the culinary team describes Italian By Night. This lovingly appointed eatery has old favorites that die-hard Italian cuisine aficionados crave plus a few surprises, like crostini with chicken liver pate, pickled fennel, and candied lemon zest, and agrodolce pizza with white sauce, mozzarella, caramelized apples, chevre, toasted walnuts, and cinnamon sugar. 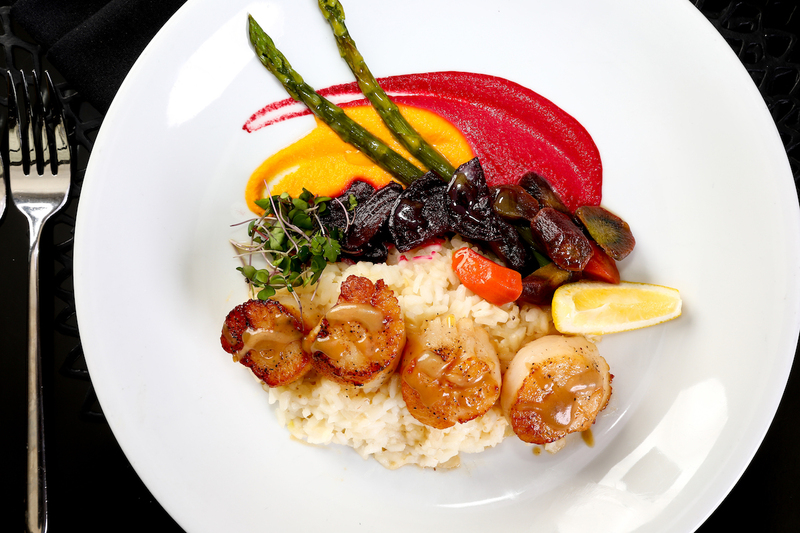 As expected in this region of Canada, there’s a bounty of seafood to garnish the pastas, like the scoglio with scallops, jumbo shrimp, baby clams in the shell, grape tomatoes, pancetta, garlic, white wine, and parsley, along with risotto di mare and scallop penne carbonara. The main course standout among many is the osso bucco di agnello with half-day braised lamb shank, sofrito, tomato-wine sauce, deep-fried polenta fries, garlic wilted greens, and a citrus garlic gremolata. Make a reservation at Italian by Night. 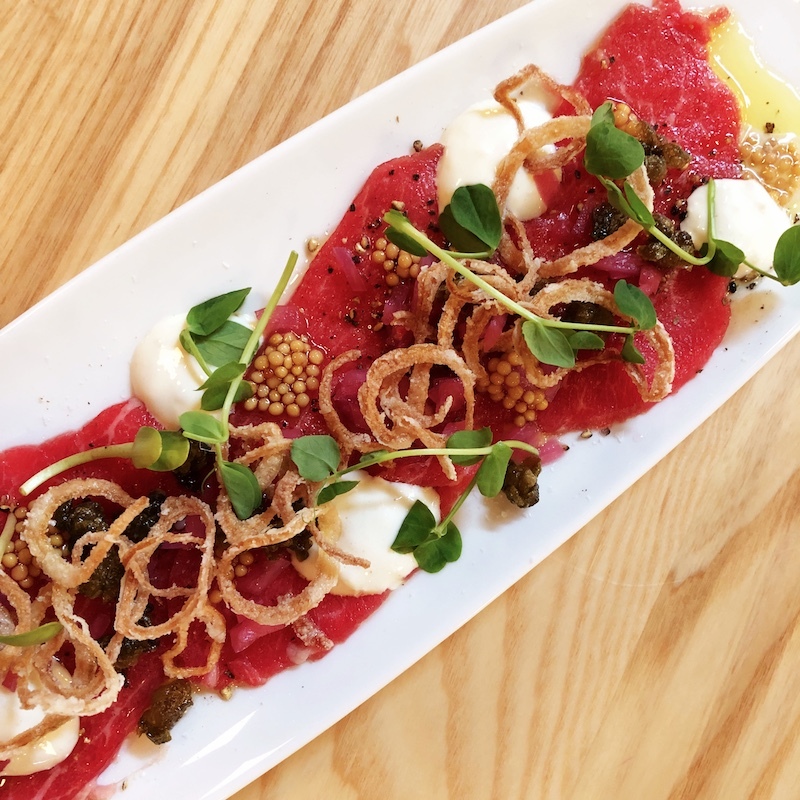 The moniker for The Ostrich Club is that it’s a restaurant designed for friends – that’s a good thing since you’ll want to bring a few along as it’s nearly impossible to choose just one dish at this Hydrostone Market locale. Items like miso-glazed oysters, fish cakes, and potato and quail egg stand out, along with squid ink strozzapreti with butter-poached lobster and house sausage, pangrattato, and mint. Moqueca, a Brazilian seafood stew, should be on the list of can’t-miss dishes. The co-owner is a Certified Sommelier, which makes this a favorite among local oenophiles. Make a reservation at The Ostrich Club. Braxton’s honors one of the first chefs at The Algonquin from the late 1800s, in the first seaside resort town of St. Andrews, New Brunswick. A previous fire roared through the main building, save the painter wing, kitchen wing, and tower. Today, the indelible spirit of the Algonquin Resort remains in this marvelously remodeled Tudor structure – including cuisine of which George F. Braxton himself would be proud. Starters include tuna tartare, duck carpaccio with sundried cherry compote, and a warm goat cheese tart with tomato chutney and arugula, while notable entrees include salmon, halibut with dill and peach butter, and beef tenderloin with Algonquin rooftop herb potato roesti. Make a reservation at Braxton’s Restaurant at The Algonquin Resort. 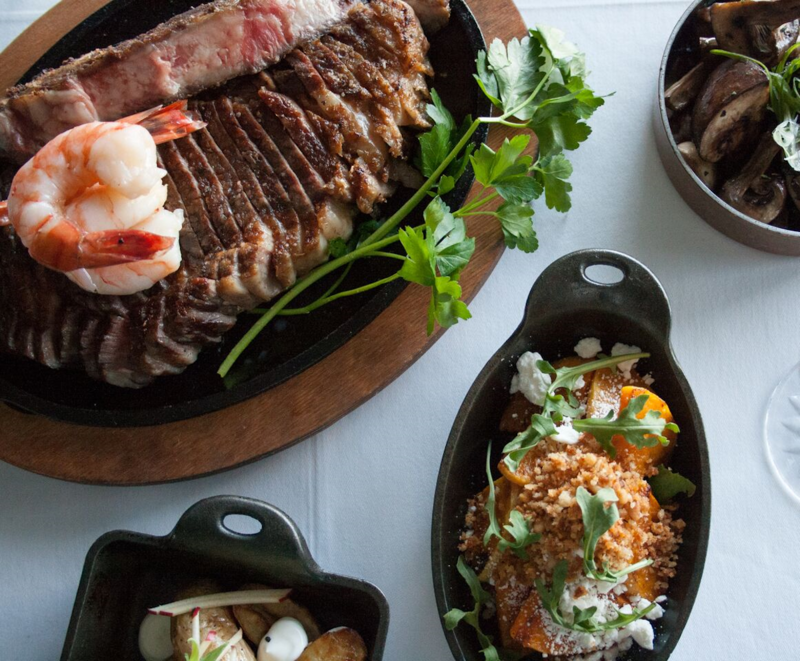 For carnivores along the Atlantic coast, the Cut Steakhouse is an irresistible choice for dinner. The steaks are prepared with in-house seasoning and finished under a 1,500-degree broiler. To taste the Angus steak from Brant Lake, Alberta, is to comprehend why Canadians need not look anywhere else for outstanding proteins. And not much makes diners salivate more than bone marrow with kale, parsley, and burnt lemon spread across house sourdough bread or the addictive toasted vanilla tart with foie gras ganache, apple, and sour cherry. Be sure to add a side of bacon fat confit potato to your order. Make a reservation at Cut Steakhouse. In what could be the coolest name for any restaurant, The Watch That Ends the Night references the acclaimed Canadian author Hugh MacLennan’s 1959 novel. In the realm of King’s Wharf in Downtown Dartmouth, views of the Halifax skyline and harbor draw new diners, while the cuisine and nearly 200 choices in spirits keep them coming back time and again. The décor in this sizzling hot gathering spot harkens back to mid-century North American hotel lounges with a library feel, along with the soundtrack trained on that fabulous, funky time in history. The cooking staff likes to call The Watch That Ends the Night fare Canadian terroir. That’s apropos considering the varied menu includes borscht made from locally farmed beets, oven-roasted cod, confit chicken, falafel, and pork loin with garlic and herb bread pudding. Make a reservation at The Watch That Ends the Night. 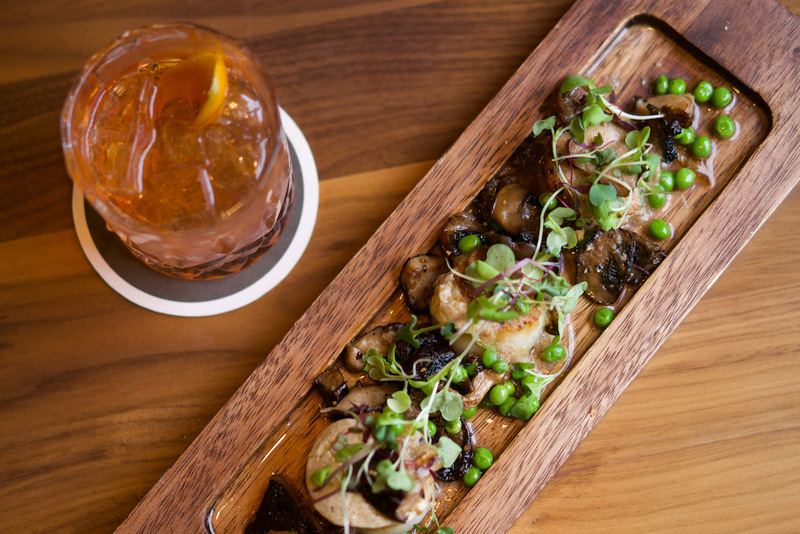 Inventive versions of classic favorites take center stage at Agricola Street Brasserie. For example, if you thought you loved risotto before, wait until you try it the Agricola way – past creations have included nasturtium butter, peas, and horseradish risotto, and, most recently, smoked salmon, crispy leeks, fish roe, saffron, and lemon risotto. Confit duck leg with pear, bacon, shallot, currant, and lentils makes the cut as one of regulars’ top entrée choices, while dishes like buta kimchi, Agricola’s signature pork belly, and rotolo with béchamel sauce, zucchini basil cream, and soft yolk are perfect for sharing. Make a reservation at Agricola Street Brasserie. In a tale full of lore and legend, The Five Fishermen Restaurant draws history buffs as much as culinarians. The building dates back to the early 1800s during which it has transformed from schoolhouse to mortuary and now into one of Nova Scotia’s beloved eateries. The Nova Scotia seafood chowder is a must-order along with lobster pot pie, whole grilled fish, spiced pork belly tostada, and the five fish special with green pea risotto. Make a reservation at The Five Fishermen. Even though chilly days and nights are still upon us, it shouldn’t stop you from seeking out new culinary experiences. Bundle up and grab your favorite fellow oenophile on a Thirsty Thursday or your next adventurous weekend dining outing and head to some of the most celebrated winery restaurants in British Columbia to bond over exploring new wines and delicious flavors. British Columbia winemakers are passionate about their wines and their customers, giving this area of Canada a distinctive identity in 60 types of grape varietals grown throughout Vancouver Island, Gulf Islands, Fraser Valley, Similkameen Valley, Kanagan Valley, Kootenays, Lillooet, Thompson Valley, and Shuswap. According to the British Columbia Wine Institute, as of 2018, four regions were approved as geographical indications including Thompson Valley, Shuswap, Lillooet, and Kootenays. 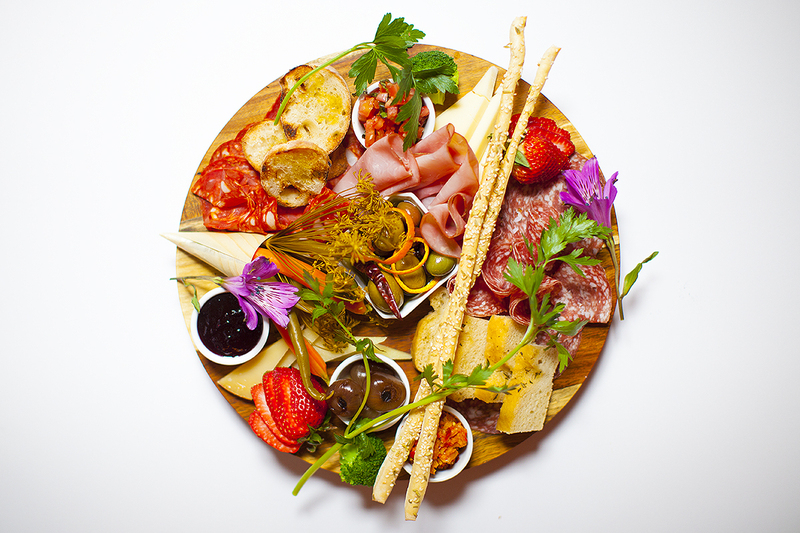 Ranging from crisp reds to creamy whites, playful Rosé and dessert vintages, the food and wine relationship in this diverse region is a dreamy pairing. 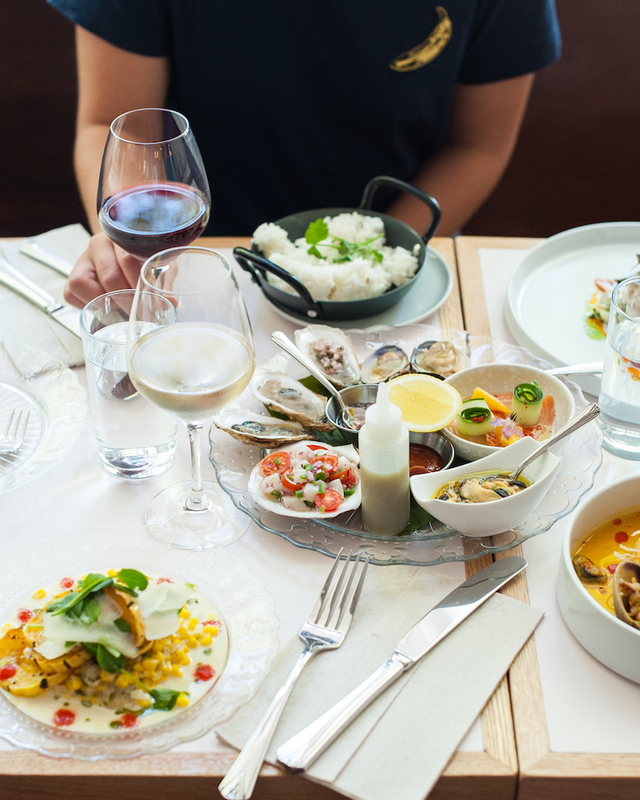 And even if you’re not headed to the B.C., OpenTable has you covered with more than 48,000 spots around the globe – including one that’s right for you. As wineries go, guests can usually expect to find elegant surroundings, picturesque views, and sublime tastings. Summerhill Pyramid Winery events has all of that but takes top prize for the most joyous presentation. Events are subject to change, but count on always finding fun in evenings like Thursday night fondue, happy hour, prime rib night with discounted wine specials, and pizza night. A few dishes that have become favorites with regulars include crispy pork belly, Cajun prawns, and lentils Wellington. Make a reservation at Sunset Bistro at Summerhill Pyramid Winery. For decades, the Golden Mile Bench sub-appellation has been home to Tinhorn Creek Vineyards. 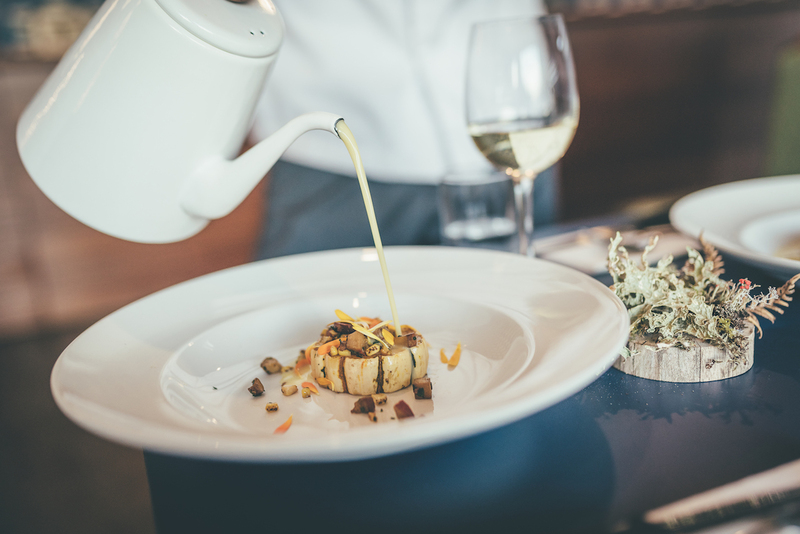 Here among 150 acres of grapes, the Miradoro restaurant serves up panoramic views with dishes like chef’s daily soup, clams, and chorizo in saffron sauce, and venison Bolognese and bucatini, along with other delights from Manuel Ferreira’s Mediterranean-inspired menu. A must-try at Miradoro at Tinhorn Creek Vineyards is the quattro formaggi, zucchini with white sauce, or pancetta pizzas, prepared in the authentic forno oven. Miradoro is open from March through December. This winery is also popular with dog lovers sniffing out a perfect picnic spot – the grounds are dog-friendly and during summer a bevy of concerts gets toes tapping. Make a reservation at Miradoro at Tinhorn Creek Vineyards. 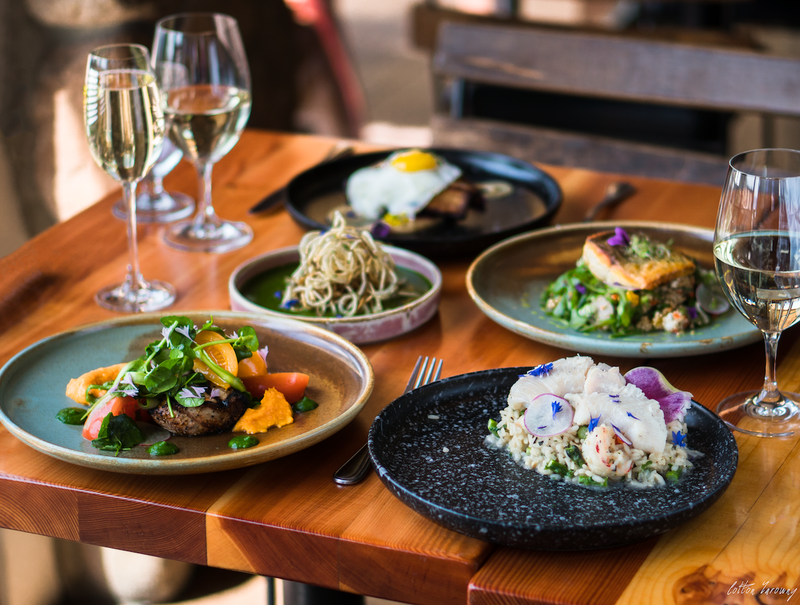 If the views don’t make you swoon at Burrowing Owl Estate Vineyards, the menu at The Sonora Room certainly will: think pea risotto with local goat cheese or smoked octopus with crispy black olives, nasturtium, and sorrel. Located in Oliver in the South Okanagan region of British Columbia, Burrowing Owl Estate Winery is home to premium VQA wines. Guests who want to stay overnight have the option of an 11-room guest house. Patio dining is the luxe du jour here, spanning vistas of 140 acres honoring the region’s agricultural past and present. 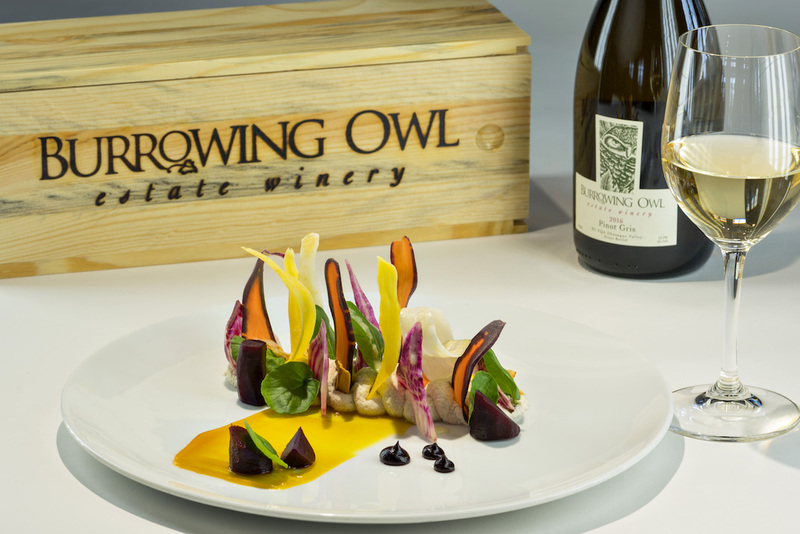 Make a reservation at Sonora Room at Burrowing Owl Estate Vineyards. 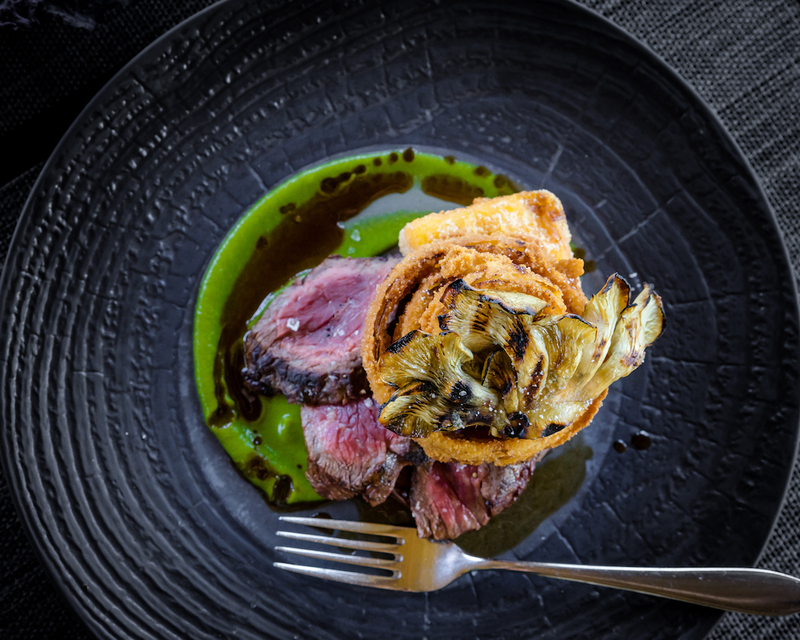 The ever-changing menu at Old Vines Restaurant at Quails’ Gate Estate Winery is one reason it consistently makes OpenTable’s 100 best lists. Steamed West Coast clams with chorizo, onion, white wine, and tomato paired with a Chenin Blanc and paté en croute paired with Cailleteau Gamay Nouveau are among the savory dishes gracing the appetizers. Wild Coho salmon and local duck breast with roasted sunchokes and parsnip purée make the cut as entrees. 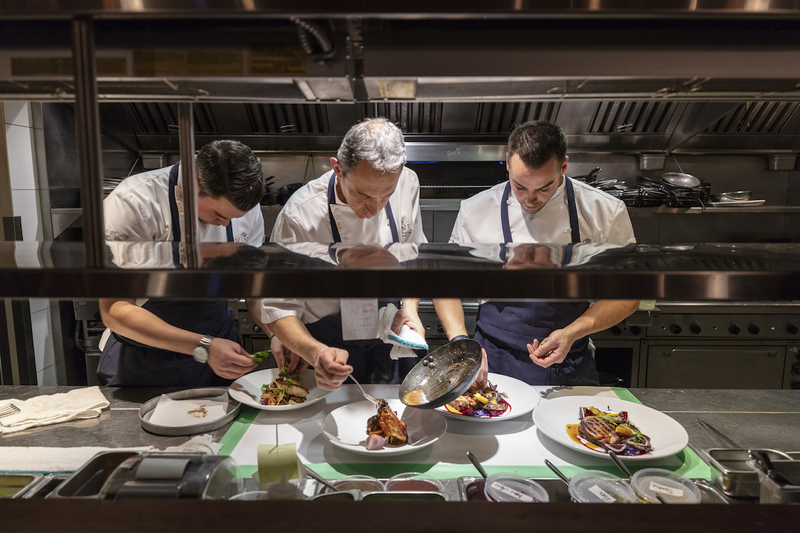 Dishes feature a vast pantry of ingredients from throughout British Columbia, with special attention paid to the valley’s purveyors. The Old Vines patio is a very special spot, inspiring romance or just reflective time taking in the lakeside sunset in view. Make a reservation at Quails’ Gate Estate Winery-Old Vines Restaurant. It’s peak ski season across Canada and the U.S. Just as fun as hitting the slopes is the calorie-reloading that commences after a long day skiing or boarding your way all over the mountain. Whether you’ve got the whole family in tow or it’s just you and your favorite powder hound, here are top restaurants to try on your next ski trip. Headed to other destinations? Check out the more than 48,000 restaurants worldwide on OpenTable to find a spot near you. East Gros Ventre Butte overlooks the Snake River Valley in one of Wyoming’s most awe-inspiring views. Even when the ground is covered with snow, diners can’t help but meander outside to the Amangani pool, cocktails in hand, to breathe in the expanse of a landscape unlike anywhere else. After a day of snowshoeing and skiing the Jackson Hole backcountry, in the shadows of the distant snow-capped peaks, Amangani Grill calls guests to its sustainable ranch meats like elk and fresh fish. Fireside snacks from the all-day menu include charred onion soup, foraged mushrooms with farm egg and toasted pine nuts, Vietnamese pork wings with fried garlic and green apple relish, and steak burgers with tomato balsamic jam, tobacco onions with bleu cheese fondue, and petite kale. Make a reservation at Amangani Grill. Haute chocolate, oysters, and steak await après-skiers at Flame Restaurant. At this lively steakhouse, the staff and diners share a mutual love of dishes like the 7x Ranch Wagyu beef and elk corn dogs. 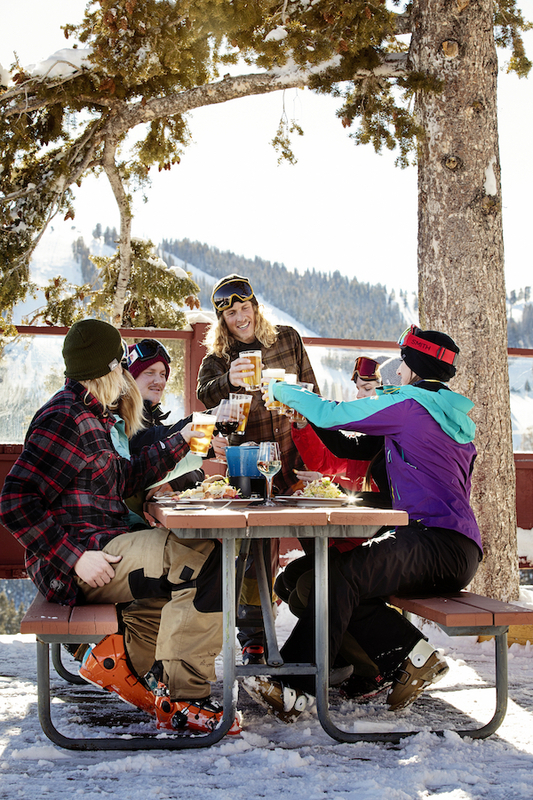 They advertise après but elevated – especially on weekends in the late afternoons. 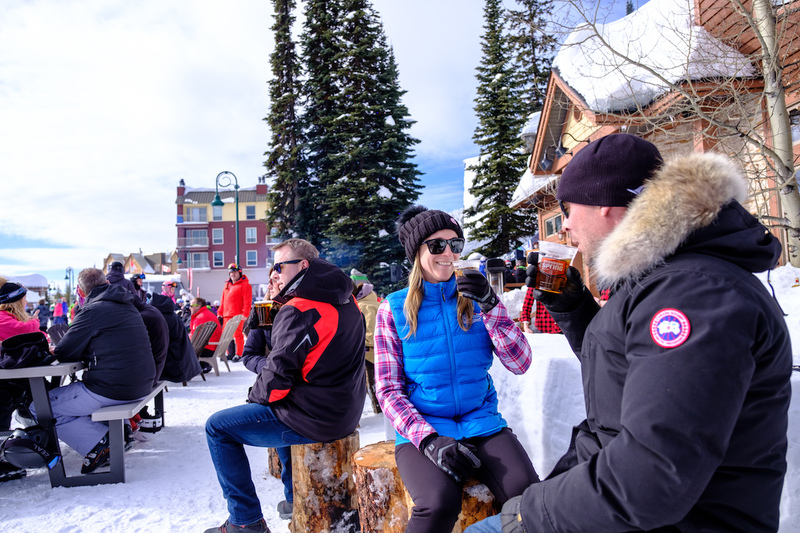 On Fridays and Saturdays from 3-5PM on the Flame terrace, views of Vail Mountain are on full display for guests enjoying live music and the raw bar. More than 3,000 acres account for the back bowls on Vail Mountain out of the 5,000 skiable acres in Vail. Talk about working up an appetite – good thing the Flame Restaurant also offers the special ‘steak out’ high on Vail Mountain for die-hard skiers not quite ready to call it a day. Make a reservation at Flame Restaurant. Oso translates into “bear” in Spanish, a moniker that points both to the wildlife in this natural wonderland and the tantalizing menu of Spanish-influenced cuisine. This is where to get tapas on the mountain, delightful bites of housemade charcuterie and montaditos, which are artisan bread snacks with garnishes like spicy nduja and passionfruit, spreadable salami, Romesco sauce, and Matane shrimp or duck liver parfait with candied orange zest, but don’t leave without sharing an order of Iberico ham pintxos (on skewer) or the gilda with anchovy, olive, and piparras. Large plate examples include lamb meatballs and Waygu short ribs. The community bar offers an ideal meeting place for lively conversation, greeting old friends, and making new ones. 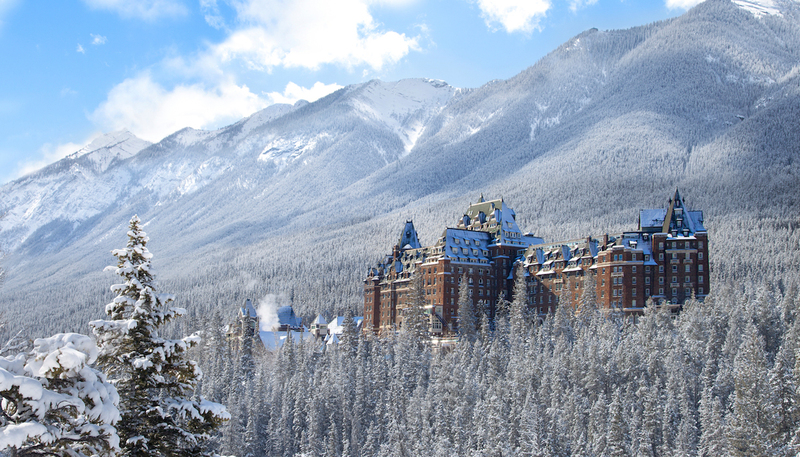 In addition to the snowy views, gourmands love to sit at the open bar and watch the chefs create their finest plates. Make a reservation at Bar Oso. Look up about 7,700 feet to the top of Bald Mountain at Sun Valley Resort and you’ll see why Roundhouse has earned its reputation as an iconic place to dine. Accessible via Roundhouse Express gondola, the circular restaurant provides panoramic views against the backdrop of this historic 1939 structure. 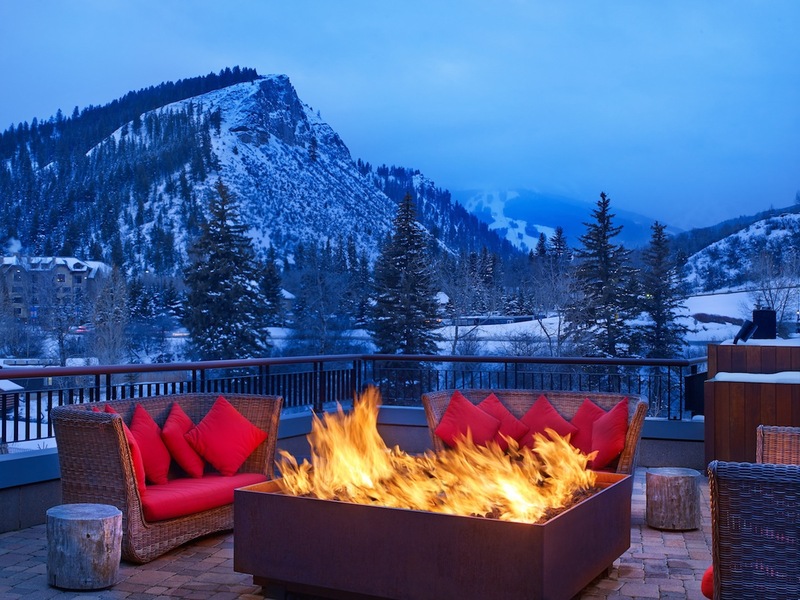 The fireplace is part of the original design for quintessential après-ski dining. Roundhouse is famous for fondue and, of course, the much-lauded “Ride the Wolf” experience before dinner, which includes a ride in a snowcat with world-class groomers on Friday and Saturday evenings. Make a reservation at Roundhouse. This is Canada’s highest dining experience, with the summit of Kicking Horse Mountain Resort in Golden clocking in at 7,700 feet. 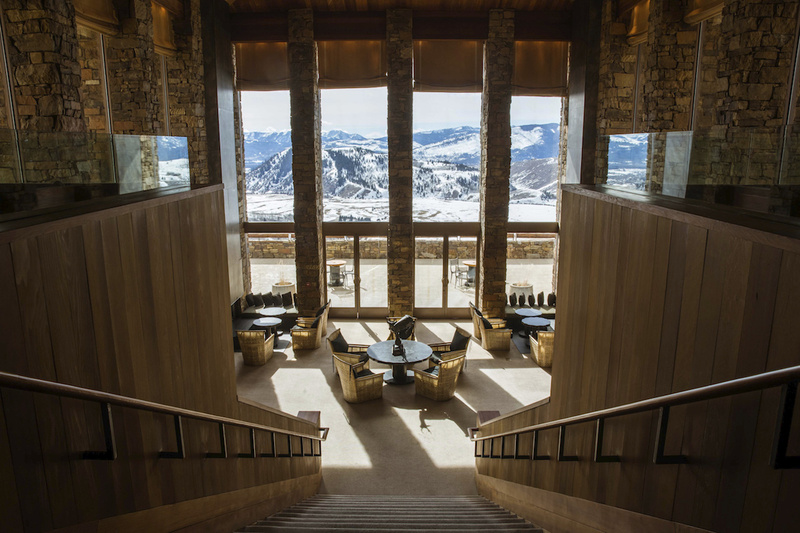 The décor honors the mountain landscape with hand-carved tabletops, local timber, and stonework. Floor-to-ceiling views frame the backdrop of three mountain ranges including Rocky, Purcell,and Selkirk while dishes like the antipasto plate with prosciutto, salami, Portneuf brie, pickled vegetables, and housemade blueberry chutney are a great beginning to the evening, along with sockeye salmon tartare garnished with fresh chives, roasted almonds, olive oil, lemon, lime, capers, and parsley. Entrée samples include game meat bolognese with slow-cooked elk and bison, half-wild boar, and Alberta tenderloin. Don’t forget to choose a few Canadian wines or artisan beers from the vast listing of Eagle’s Eye beverages. 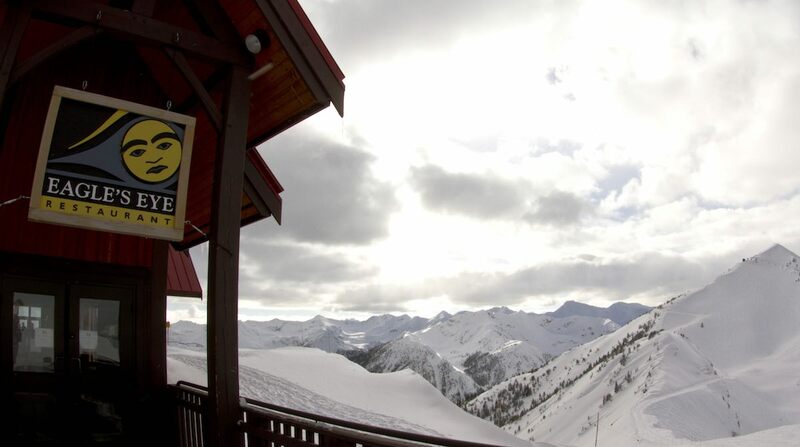 Make a reservation at Eagle’s Eye Restaurant at Kicking Horse Mountain. Few types of cuisine satisfy hungry skiers like Mexican food. Maya answers that call in its contemporary dishes created by chef Richard Sandoval. Situated on the Eagle River, guests can see Beaver Creek Mountain in the distance. Another reason to catch an après-ski evening at Maya – there are 150 tequilas to choose from, including the signature Maya Tequila made especially for the restaurant at Casa Herradura in Tequila, Mexico. It’s the ideal drink to accompany a serving of pork carnitas with black bean puree and requeson cheese on avocado espuma, blue crab and shrimp enchilada wrapped in a yellow corn tortilla on salsa verde, or an order of achiote-marinated flat iron steak on spicy puya sauce with a hoja santa tortilla. Grab a handful of Beaver Creek’s famous cookies for the family before leaving the riverfront access to the Beaver Creek ski slopes. Make a reservation at Maya-Avon Vail Valley. At OpenTable, we’ve got the right restaurant for any occasion – and oftentimes that occasion is popping the question. Approximately 2.3 million couples are wed each year in the U.S. alone*. At our more than 48,000 restaurants all over the world, proposing marriage to a loved one is commonplace. In fact, Geja’s Cafe in Chicago, Illinois, boasts 16,683 engagements at their establishment alone. 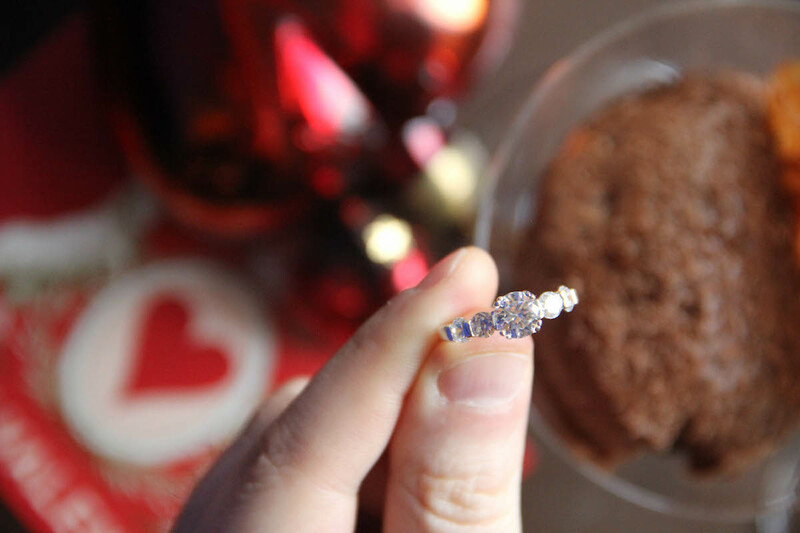 Most of those proposals come and go smoothly, but not all come off without a hitch. Aside from a few obvious cringe-worthy endeavors like texting ‘will u marry me’ over nachos, hiding a ring inside a piece of layer cake where it could choke someone, or using an ice bucket challenge to pop the question, planning the big moment should be as smooth as crème brûlée. Since matters of the heart and restaurants go hand in hand, we’ve enlisted a team of experts to share their best advice. Here’s how to propose in a restaurant — on Valentine’s Day or any day. General manager Kelly Harbison is no stranger to marriage proposals. After all, the iconic Central Park restaurant Tavern on the Green in New York City is one of the most sought after places to propose and marry. Harbison says her best tip is simple but key to a successful proposal. Co-founder of Peli Peli Restaurants Thomas P. Nguyen and his staff are known to go the extra mile for future brides and grooms, including singing one of their favorite songs. At Peli Peli Galleria in Houston, Texas, they welcomed three proposals just over the New Year’s Eve holiday. Getting the servers, bartenders and managers involved and leaving nothing to chance is his secret recipe for a perfect proposal. Vancouver’s The Teahouse in Stanley Park general manager Andy Crimp is at the helm of one of the city’s most picturesque venues where engagement events can be like memorable mini-getaways. “Find an escape from the city for the two of you, or consider renting a private room to make it surprise affair with all your friends and family,” he says. Most restaurant staffers can’t wait to help plan the perfect proposal, like at Firefly in Washington, D.C. When one of his restaurant regulars requested to propose to his girlfriend in Firefly’s rooftop garden, lead bartender Brendan Ambrose obliged. 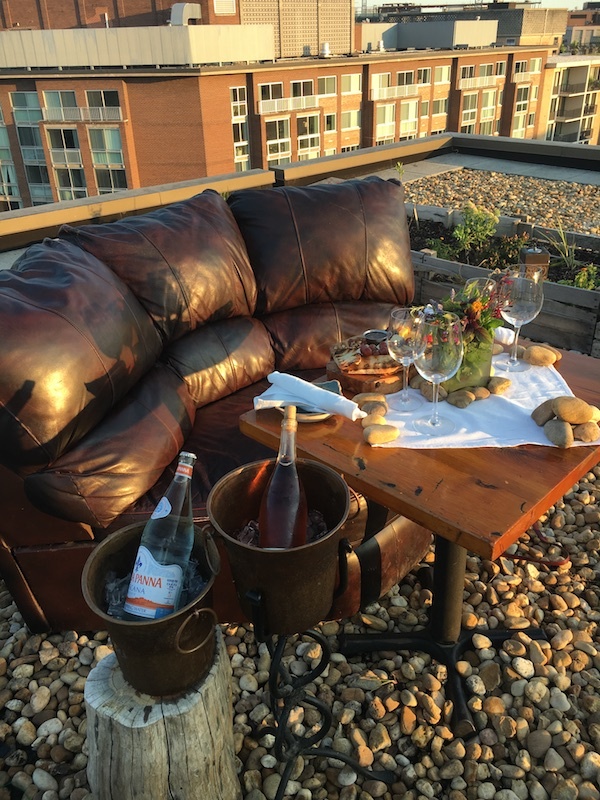 He transported a couch up to the roof to create a romantic sunset seating, incorporated the couple’s favorite wines and cheeses in a shareable spread, and handpicked fresh flowers from the on-site garden. At The Keep, part of Autograph Collection’s Hotel LeVeque in Columbus, Ohio, director of food and beverage Andrew Holmes goes a step further in suggesting the potential bride or groom sit down with the maître d’ or general manager prior to the proposal both to understand the menu and consider a partner’s needs. You may have decided on a special place, but take time to block the course of the meal. 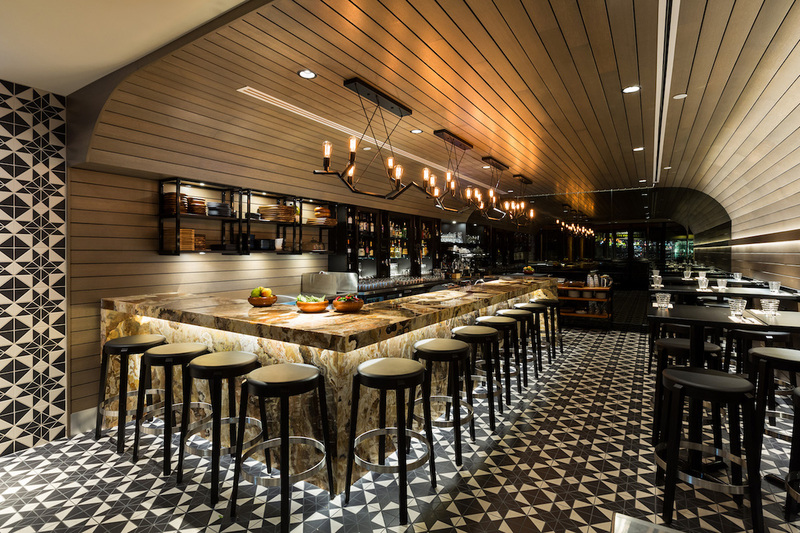 Drexel Heard is the events director for Michael’s Santa Monica where this art-laden Westside Los Angeles eatery is coming up on 40 years of service. The California cuisine lends itself to a romantic plate from small bites like dumplings with pork shoulder, ginger, and black vinegar to larger portions like duck confit or pork collar with dandelion and ginger. At nearby Barton G. also in Los Angeles, executive chef Attila Bollok says to be creative and consider the timing. “This is a once-in-a-lifetime event so feel free to think out-of-the-box and be as over-the-top as possible, but be sure to wait until dessert, because when the proposal occurs at the beginning of the meal, couples are often too overjoyed and overtaken by sharing the news with loved ones that they forget to eat,” says Bollok. “Also consider the lighting and whether you should hire a professional photographer to capture the moment.” Bollok also suggests the planner consider a weeknight proposal because they are generally less crowded.